This stew is so scrumptious and pretty easy to make - served over any grain or with some bread, it makes a lovely meal. The fragrant spices enrich the stew without making it overly spicy. I grow taro just for this purpose; leaves and stems are not always available in markets. But it is very easy to grow - see this post on How to Grow Taro. My grandmother used to prepare this dish using only the stems of the taro and called it "thalakam". You can make it with just leaves or both the stems and leaves. Other greens like amaranth, kale, collards, turnip greens, spinach, Swiss chard, etc may be used if taro leaves are unavailable in any combination. If you are using regular dried tamarind pulp instead of the concentrate, use about a 1" ball; remove seeds and any stringy fibers and soak in a little warm water; then add to the roasted spices and grind together. Sort the red lentils, wash, drain and cover with fresh water to cover; water should be about an inch above the lentils. Cook over moderate heat until soft. Masala: While the dal is cooking, prepare the masala - heat the oil in a small pan and roast all the spices and dals until fragrant and lightly browned; add the coconut and cook over medium heat until lightly browned. Remove from heat and let cool. When cool, grind finely using a blender with just enough water as necessary to get a smooth puree. 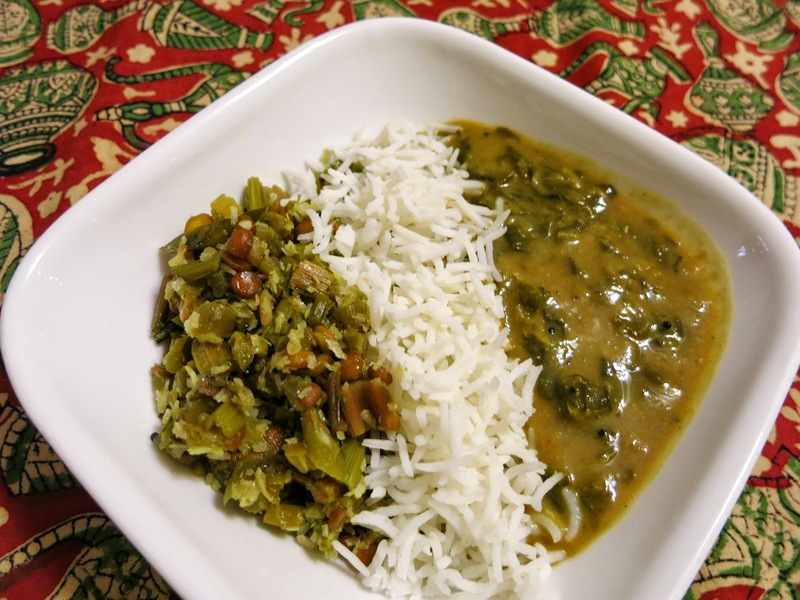 When the dal is cooked but not mushy, stir in the chopped chiles along with the taro leaves and cook for about 5 minutes. Add the turmeric, salt, and tamarind and simmer gently for 15 minutes. Pour the ground Masala into the lentils and greens; add about 1/2 cup of water to gather all of the ground mixture clinging to the blender jar and add to the stew and bring to a boil. Prepare Thalippu: heat the oil in a small pan and add the mustard seeds and chile; when they subside popping, turn off the heat and stir in the asafetida and curry leaves carefully. Quickly cover to avoid splattering hot oil. When sizzling subsides, pour the spices and oil into the stew. Stir well and let rest for 10 minutes. Serve hot over freshly cooked hot rice or other grains. This stew is good with Chapatis or other breads also.